Late last year, we discovered the Jag Rag, a fan towel created by one enterprising Jacksonville Jaguars fan named Bert Sparks who didn't care about the phrase's original definition. 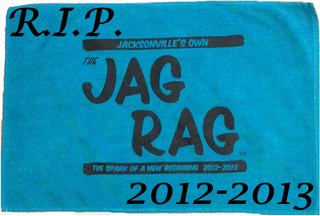 We now regret to inform you that the Jag Rag is no more. Thanks to some hoopla handed to us by the NFL, we’re out of business. Thank you to those who supported us. May the best-named fan towel rest in peace.